I haven’t posted anything about the first birthday party and here we are about to celebrate her 2nd! So let’s take a little walk down memory lane and recount what we did to mark her first trip around the sun. Since her first word was ‘at (cat) we of course had to have a kitty cat party! 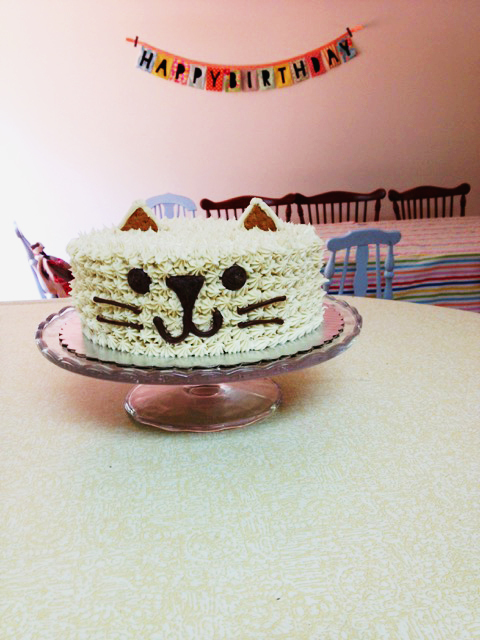 I made her a sweet little kitty cat cake. To make it I just made a basic layer cake then I did a thin crumb coat of frosting. I loaded up my pastry bag with more icing and a star tip and made “fur’ all over the cake. Then I took graham crackers and cut them into triangles, frosted the edges and the back side and nestled them into the top of the cake. I melted milk chocolate chips and put them in a pastry bag and piped the face details onto a piece of parchment paper and popped them in the freezer to get nice and firm before sticking them into the iced cake. 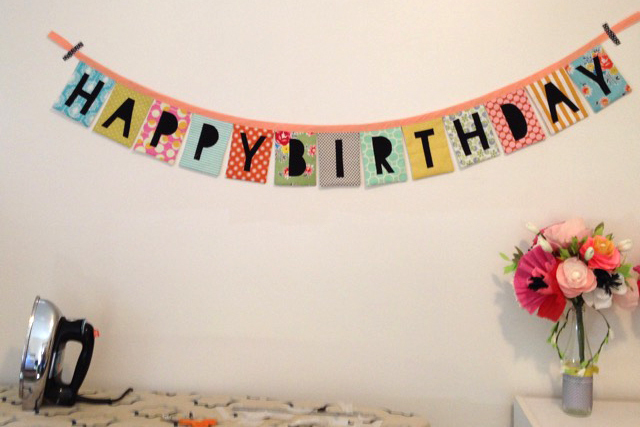 I also stitched up the little birthday banner in the background there and hope that hanging it each year will become a little tradition around here. We had a nice little family dinner party to celebrate where she got lots of fun gifts, which she seemed just as excited about as the wrapping paper she tore off of them (ha!). 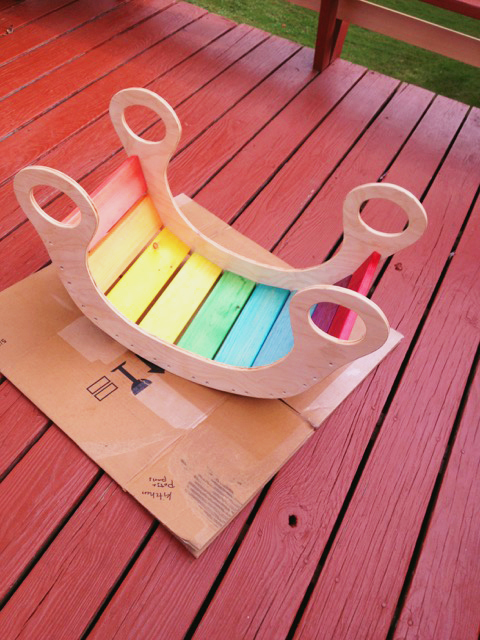 As her “big” gift from us, I made a rainbow rocker out of birch plywood and pine stained with food coloring of all things. She continues to enjoy it and it’s versatility to rock in it, rock her dolls in it, flip it over and climb under, or climb over the top. Safe to say it was a total hit. 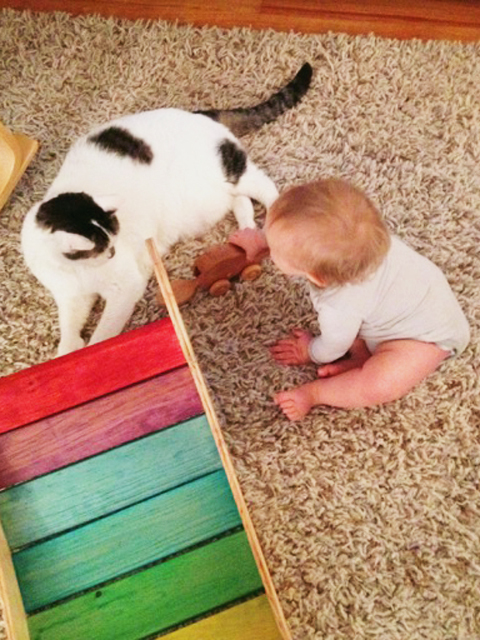 Here she is with her ‘at, Mickey (he likes to nap under it too). She is sooo much bigger now, what a difference a year makes! 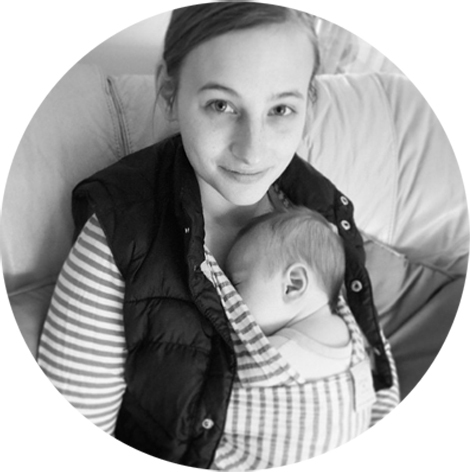 I am having fun dreaming up ideas for her moon themed 2nd birthday party–I can’t wait to share details of that & what I’m making for her birthday gift!